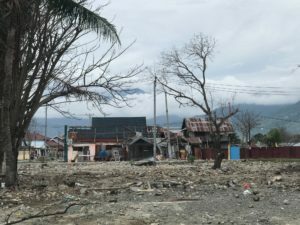 A major earthquake and tsunami hit the island of Sulawesi in September 2018, devastating the regional capital Palu and surrounding areas. 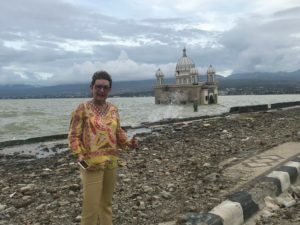 Palu, home to 350,000, was flattened by the tsunami and the city and its surrounding areas now face a public health crisis as access to water and clean sanitation is limited. More than 74,000 people were displaced and many lost their lives. 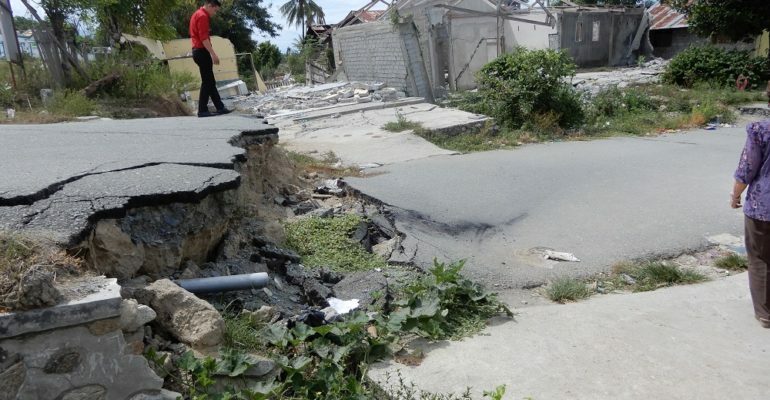 This makes it the deadliest earthquake to strike the country since 2006, as well as the deadliest earthquake worldwide in 2018, surpassing the previous earthquake that struck Lombok a few months earlier, killing more than 500. 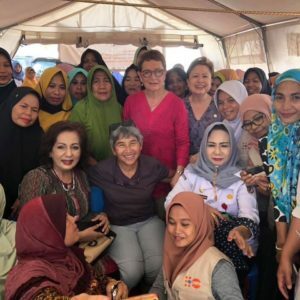 SI President Mariet Verhoef-Cohen and SISWP Federation President Anusha Santhirasthipam made an official visit to Indonesia from 3 – 8 February 2019 to witness first-hand the conditions in both the Palu and Lombok area. They were accompanied by Isla Winarto, one of the founders of SI in Indonesia, and Lily Kasoem, Sylva Hutagalung, and Esti Utami, members of SI Jakarta and SI Kemang. Visiting several villages including Mamboro, Taripa, and Toaya, in Palu, Central Sulawesi, the Soroptimist International delegation was invited by Mrs. Hj Siti Norma Mardjanu SH MSi MH, Governor’s Expert Staff in Government, Law and Politics of Palu. The SI delegation visited the Women’s Camp in Balaroa, Palu, where they talked with women about the assistance required, and a meeting was held with members of the Sikola Mombine NGO Foundation, which works on programmes of empowerment and vocational training to empower women and girls at the grassroots level in and around Palu. Photo: Mariet visits a mosque now in water and slowly sinking. The Iman was swept to the shore and survived. It is therefore with good reason that local Soroptimist clubs SI Jakarta and SI Kemang have proposed projects for the President’s Appeal, Women, Water & Leadership (WWL). The delegation members met on 8 February 2019 to review the prospective project proposals in Palu and Lombok, aimed at alleviating some of the hardship suffered by those affected by the earthquake. Thanks to their on-site first-hand investigation they were able to successfully make a detailed plan, itemise budgets, find suitable local contractors and programme training partners, and schedule work components and effective monitoring and measurement of results. The SI members from SI Jakarta and SI Kemang form a highly competent, experienced, and passionate team in Indonesia. 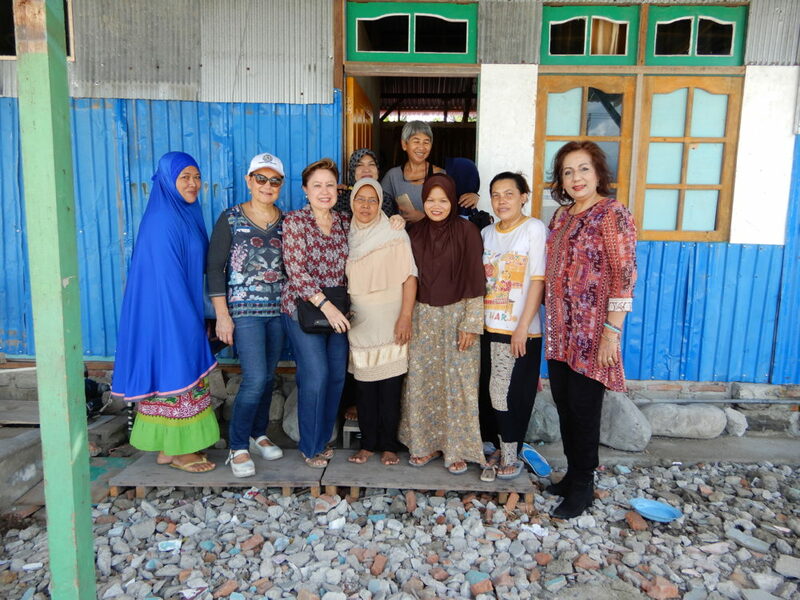 Hopes are high that a WWL project in Palu and in Lombok will be approved, after which it will be up to all Soroptimists in our 122 member countries to assist with fundraising. First look at Lombok Initiative of SI Jakarta. Plan is well on the way. In villages in central Lombok, Rembitan with 250 families and Rebuk Satu with around 31 families, tourism has come to a standstill due to structural damage. No tourism means no livelihood; the women suffer because of the drop back of tourism. They are in urgent need of WASH facilities, which no longer exist. WASH stands for Water, Sanitation, and Health. Now, women have to journey to a well at night to access water, as the well generally has no water during daytime. Traditionally, the women are weavers, however, there is no money to revive the industry, for which they would need water for the natural dyes. The President’s Appeal project will focus on WASH facilities: toilet blocks with bathrooms and 125 male and female toilets, with approximately one toilet per five people. The project will include upgrading the well and building community clothes washing centres. At present, the women wash outside once a week when and if it rains. A water committee led by women will be set up to initiate a programme to increase awareness and understanding of water conservation. A centre will deliver vocational training on the subjects of water, waste water, waste management, hygiene education, and including lessons on hand washing and the consequences of open defecation… Forty per cent of the local population is still forced to defecate in the open, this must be reduced! With child exploitation, women’s trafficking, and child marriages being serious issues in the village, this same centre will also train villagers in women’s rights and offer women other vocational training, such as weaving with natural dies, how to batik, and on-line selling and buying. The women in the village need assistance and training in setting up businesses and SI Jakarta have contacts with business women who can be involved and are very willing to help; an “Adopt a business woman” programme is being developed. Around 1,200 people – 318 households – 500 women, live in the very poor Palu area. Many inhabitants are farmers, mostly men, who work on other people’s land, with no guarantee of daily work. Women must therefore also try to earn an income. Some are teachers, most are housewives. Women struggle to find jobs. There is a need for vocational training and assistance in setting up the women with opportunities and skills to earn an income. Although those who are better off have toilets, the piping from the water tank is missing, and for everyone else, it is crucial to set up toilet blocks. Following the recent on-site visit by the SI delegation, SI Kemang is busy making a project proposal for this area. The project may include mentoring, training in water and waste water management, sustainability, and reuse. SI Kemang will partner with the NGO Greenaration (http://www.greeneration.org/) and the NGO will deliver courses on recycling with an income generating programme. Greenaration will create Green rangers, who will become the leaders in that specific area. These leaders will be mostly young people who will involve and work closely with the women. There will also be cluster groups focused on business interests. We look forward to this project taking off in the very near future.